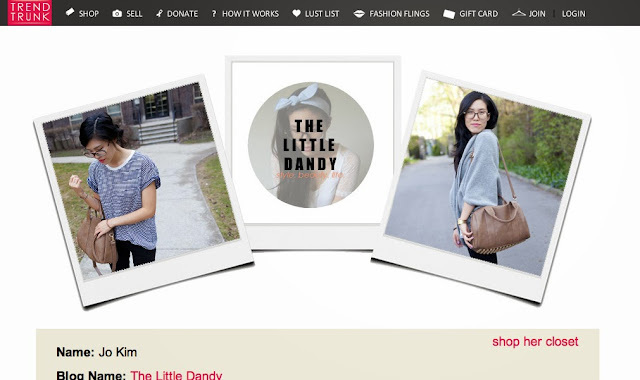 THE LITTLE DANDY : Blogger Fashion Week & Trend Trunk + GIVEAWAY! Blogger Fashion Week & Trend Trunk + GIVEAWAY! 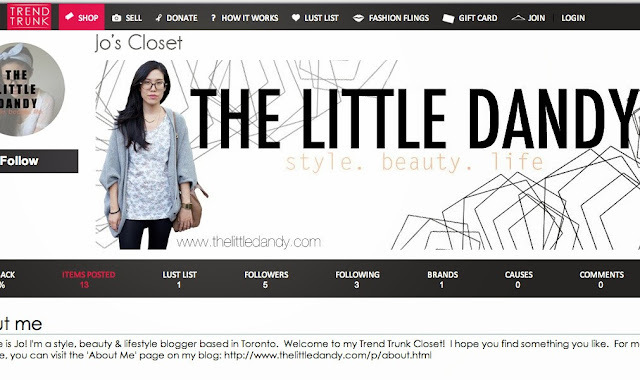 This past week (from December 9 through to the 15th) Trend Trunk hosted Canada's very first Blogger Fashion Week. Over 70 emerging Canadians fashion bloggers were featured, and I was so happy to be a part of it! Scroll down to see me featured on Day 5 of Blogger Fashion Week! If you haven't heard of Trend Trunk yet, allow me to explain. 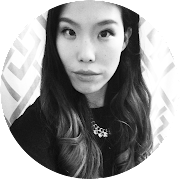 Trend Trunk has created a solution for Canadian fashionistas and shopaholics everywhere; they are a free online marketplace (much like the well-loved Kijiji or Craigslist) for selling your own new or pre-loved fashion and beauty products for money. What makes Trend Trunk so special and different from other online marketplaces is that they offer a unique service that completely eliminates the awkward meet-ups to sell your stuff. They are exclusively partnered with Canada Post, which allows for them to ship the seller all labels and packaging needed for the seller to painlessly ship items to the shopper. Easy peasy lemon squeezy! Another unique and convenient feature of the site is that it easily allows you to donate your earnings to a charity of your choice. Are you loving them yet?? Be sure to check out my Trend Trunk closet and be sure to follow my closet to keep up with new items for sale! As a thank you to all of YOU (my followers, subscribers, readers, etc), Trend Trunk was kind enough to offer a Mystery Gift Card giveaway in partnership with my blog. Feel free to simply click the image above to be taken to the giveaway page! 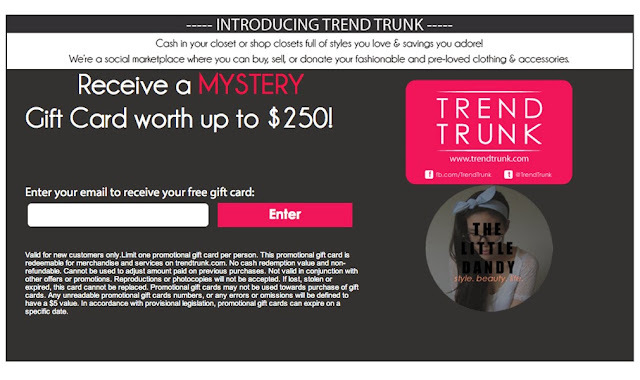 All you have to do is enter your email address, and you will be sent a mystery gift card to use when you shop on Trend Trunk! Of course, as Trend Trunk is currently only available within in Canada, the mystery gift cards can only be used for purchases within Canada. Each gift card has a minimum value of $5, and a 4month expiration date. Perfect to use whilst holiday shopping! Aw man, I wish I found out about this sooner! Such a great way to find new Canadian blogs though.